Girl at Mirror, a Norman Rockwell painting, appeared on the cover of The Saturday Evening Post published March 6, 1954. This is yet another timeless favorite of Rockwell collectors, a classic for all the ages. This painting was Rockwell's 281st overall out of 322 total paintings that were published on the cover of the Saturday Evening Post. Rockwell's career with the Post spanned 47 years, from his first cover illustration, Boy With Baby Carriage in 1916 to his last, Portrait of John F. Kennedy, in 1963. This was also the third cover for The Post in 1954. In 1954, there were five Norman Rockwell Saturday Evening Post covers published. The original oil on canvas painting, 31.5 x 29.5 inches or 80 x 75 cm, is currently part of the collection of the Norman Rockwell Museum of Stockbridge MA. on page 197 of Norman Rockwell, A Definitive Catalogue by Laurie Norton Moffatt. Two different preliminary versions, studies, of this painting also appeared in The Norman Rockwell Album on page 138. Three photographs used in the painting of this illustration, as well as the painting itself, are reproduced in Norman Rockwell: Behind the Camera by Ron Schick on pages 134, 135 and 136. There is also an extensive section devoted to the memories of the model for this picture, Mary Whalen, who was also the model in Day in the Life of a Little Girl and Girl with Black Eye. Mary was the daughter of Rockwell's attorney. 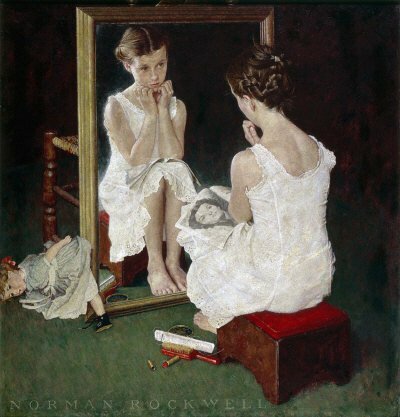 This classic Norman Rockwell painting shows a girl contemplating her reflection in a mirror. The girl has propped her mirror up with a chair. She has fixed her hair. Her comb and brush sit beside her on the floor. The girl has also applied some makeup to her face. Rockwell had originally tackled the subject of a girl and makeup much earlier in his career. She has set aside her doll. This young girl is just growing up. She is becoming aware that she is on the verge of becoming a young woman. She gazes into the mirror. She appears to be comparing her reflection to the picture of the model on the cover of her magazine. This is, of course, never wise. The model's image is carefully sculpted and manipulated. The model doesn't look the same in her own mirror as she does on the magazine cover. Naturally, the girl will realize all that one day. But, today, she is indulging in a comparison. And, today, judging by her posture, body language and the expression on her face, she must feel that she is coming up short. She probably doesn't even realize that she has her best years, both in appearances and reality, ahead of her. Girl at Mirror was only one of 322 Norman Rockwell Saturday Evening Post covers; Here is the list of Norman Rockwell Saturday Evening Post cover illustrations. One day in the future, that model may be gazing at a magazine cover featuring this girl as its centerpiece. The model may also then unfairly compare herself to the younger woman's beauty. Comparing apples to oranges is never fair to either fruit. The same goes for comparing younger beauty to mature beauty. Norman Rockwell, for all his realism, usually presents several messages and themes in his later works. The fleeting nature of both beauty and awkwardness are well illustrated in this painting.